BeaverTails are a Canadian "delicacy" consisting of fried dough shaped like a beaver's tail, sprinkled with cinnamon sugar. Think funnel cake meets cinnamon donuts from the fair or cider mill. 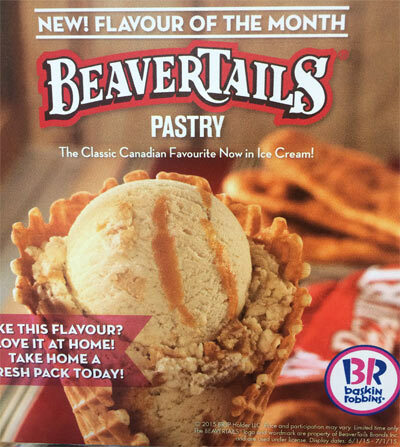 As you can see, the BeaverTails Pastry ice cream consists of cinnamon-caramel ice cream with chunks of BeaverTails pastry, and a fried dough (!?) swirl. The description actually sounds pretty appealing to me and actually intrigued me enough to leave the house to eat ice cream. For whatever reason, I don't usually get my ice cream from ice cream parlours, but rather buy pints or tubs from the grocery store. I can't figure out if it's a price thing or a convenience thing, but I digress, I'm at 31 flavours now. As you can see from the picture, it doesn't look much like the promo picture above, but I think that's a good thing in this case because it actually looks better in person than it does in pictures. One funny thing to mention, there aren't going to be a bunch of pictures unfortunately because the ice cream and ripple and caramel and fried dough swirl are all the same beige colour so it doesn't photograph well. Can't really judge the smell due to the fact they were making fresh waffle cones when I was in there, but the mix of the hot waffles and this ice cream, in fact did smell like a BeaverTails truck. The initial taste was identical to the taste of the milk you get at the bottom of a bowl of Cinnamon Toast Crunch. The base is creamy, and cinnamon-y. 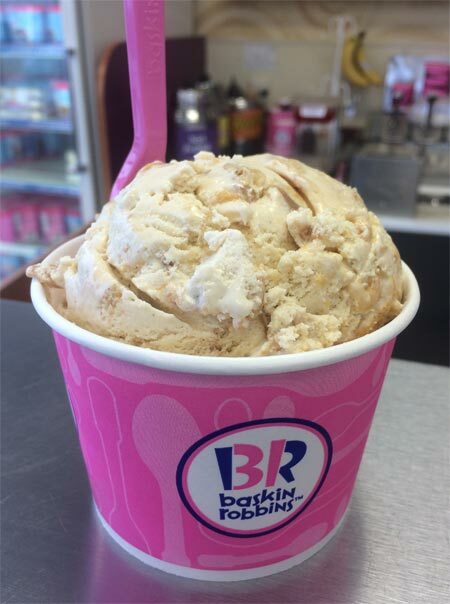 The caramel ribbon is the basic BR caramel ripple. Sweet, buttery, burnt sugar creaminess that everyone loves. It very much compliments the ice cream. In fact, I'd eat cinnamon caramel swirl ice cream if it were a thing. Before I move onto the actual pieces of pastry in the mix, I want to address the fried dough swirl. When I first read the description online I assumed it was just going to be a brown sugar ribbon with a bizarre name, but I was wrong. The best way to describe it is to have you imagine you just bought a dozen piping hot, crispy, sugary donuts from the fair. The next day after all twelve donuts have disappeared, the one thing left is the mix of greasy, sugary, cinnamon-y, crumbs at the bottom of the paper bag that they came in. That's what this ribbon is! No more feeling guilty about licking your finger and dipping it into those delicious fried sugary morsels, because you can confidently eat them in this ice cream. I wish I was able to take a picture of the pastry pieces in this ice cream but like I said before the entire mix was off-white. The initial taste of the pastry isn't like a fried donut, but rather a boxed cake. Cinnamon coffee cake to be exact. The fact that fried dough was put into wet frozen mix I'm sure changed the texture but the fried ripple makes up for it. You could call this ice cream Coffee Cake ice cream and no one would be the wiser. I like the cake pieces, and they are reminiscent of when you go to a child's birthday party and they offer you the obligatory grocery-store slab cake and vanilla ice cream. When you scrape your plastic fork across your paper plate, mixing whatever cake crumbs are left with the melted ice cream. The texture is exactly that. It's a nice change from the ice cream I usually eat and reminds me of the long discontinued fan-favourite from Haagen-Dasz, Sticky Toffee Pudding, with it's caramel base and cake pieces. Verdict? creamy delicious base, moist cake pieces, and the crunchy fried bits make this a definite guilty pleasure. It's the perfect kind of treat that I wish I could buy at a grocery store. Buy Again? I'll definitely eat it again before it's gone at the end of the month. Dubba's Note: Big thanks to Jeffrey for checking this out for all of us. Nick reminded me that I had wanted to try the U.S. version which was aptly named "State Fair Fried Dough" last year and now I'm kicking myself that I didn't (this flavor also bares some resemblance to the recent "Golden Oreo 'n Churro flavor" that I also missed). My disappointment aside, this seemed like a great time to try a Canadian review on everyone and see what you think. Should we do more of these? Please let me know your thoughts in the comments. Love your reviews. This is by far the ice cream blog with the most frequent updates. Quick question: How quickly do they get rid of the monthly flavors? I will be able to visit a BR on the 3rd of july. Should I expect it to be gone by then? @Anon: It varies from store to store, but I would take the general rule of thumb to be that it ends when they run out. If they run out June 28th, they wont order more. If they still have some July 1st, they (hopefully) will serve it until they do run out. i like the canadian review - just sad i will never be able to try this! it sounds so good. Yes, more Canadian reviews! The ice cream brands here are very different from the ones in the U.S. A lot of region specific brands (to the point of those brands are the only thing certain people have ever eaten) and "Canada only" flavours. Fun to have a canadian review; well done! How about Canadian flavour suggestions or a Canadian contest ? Canadian Maple bacon ice cream anyone ? Beaver tails are Elephant ears in America. @Hunter: Ha! Apparently it is! New England calls it fried dough and I've also had it as funnel cake (mid-atlantic name I believe).